The season of change is upon us. It’s the first day of summer (or, technically, “Meteorological Summer”) this week. So, titling this blog post “The Dog Days of Summer” may seem premature. But, around our house, it’s very timely. Memphis is a rescue dog, who came into my husband’s life about the same time I did. Memphis had been found in Arkansas, where he had been abandoned. For some reason, the rescue people opted to call him Memphis because, they reasoned, he came from the south. (Apparently their geography wasn’t very good.) Later, we added “Edina” as his second name, because we thought Every Day I Need Attention was a funny and fitting acronym for his temperament. Memphis had a hard life before he found his way into ours. He had been on the streets long enough to have broken a leg, and have it heal in the wrong direction. But this disability certainly doesn’t slow him down in the least. Memphis was a bellwether, of sorts, for me. Since he seemed to like me from the beginning, I figured that it must mean that my new “boyfriend” liked me as well. I don’t think it would have been a deal-breaker if Memphis hadn’t taken a shine to me, but let’s just say I’m happy this wasn’t the case. My point for sharing our story of Memphis with you is this: Change can be scary. But it can also be good. Memphis has gone from being a homeless, broken dog on the streets of Arkansas, to living in a loving home in Minnesota. He’s had a lot thrown at him in his short life, but he persevered and ultimately prevailed. I’ve learned a lot from Memphis, and love him dearly. But that still doesn’t mean he’s allowed on the couch. 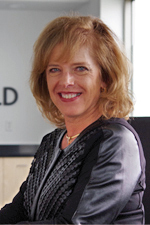 Ms. Beranek was appointed Clearfield president and CEO in 2007 after having served as President of APA Enterprises’ subsidiary APA Cables & Networks. Within 15 months of her appointment, she successfully re-positioned the Company for dramatic growth. Under her direction, Clearfield has reversed 20 years of losses, recorded five consecutive years of profitability and posted historic gains in both the market capitalization and shareholder equity. Today, Clearfield is a multinational business with more than 175 employees and over 580 customers.